Narcissus (detail) John William Waterhouse. 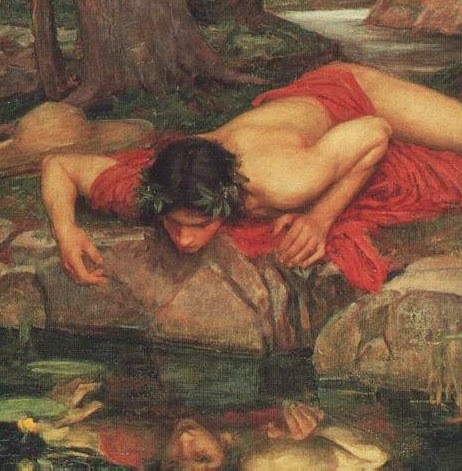 When the hunter Narcissus fell in love with his own reflection, he was looking into a pool of water. Self-love is so much easier these days: we have mirrors. Even 200 years ago, if you were an ordinary person you might have seen your reflection in a shop window, or a still bowl of water or on polished metal occasionally. 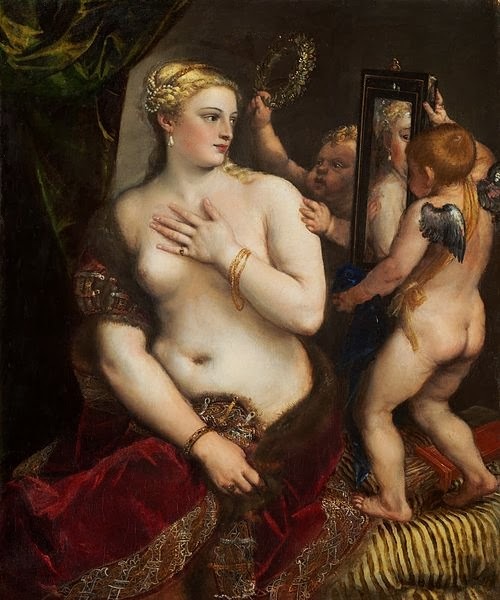 If you were wealthy, you might have had a grand-luxe Venetian mirror, but even those had only been invented a few hundred years earlier. For most of history, most people have not really known what they look like. Your best gauge might have been other people’s reactions. Beauty truly was in the eye of the beholder. Mass production of mirrors began in the 1850s. This was the last time Neptune was in Pisces. That’s important because the planet Neptune rules illusion, glamour and mirrors — and Pisces is Neptune’s own sign. If you think about it, since the 1850s, avoiding your reflection has become increasingly difficult. First there was photography, then film, then television. All these media reflect our selves back to us. These are mass media, reproducible, widely distributed. At first on film and television, we had actors reflecting ourselves back at us through art. Then in the last decade and a half, we’ve had reality TV, which feeds on the narcissism of the participants. Neptune has been in Aquarius, the sign of the common man (and technology), and now Pisces. Since Neptune went into Pisces we’ve seen the rise of the selfie, and the parade of personal photographs on Facebook – which is itself a mirror. To read more on the latter click here. Traditionally, Venus, the planet of beauty and art, is exalted in Pisces. In other words, in the sign of glamour, Venus is exaggerated when she dives into the oceans of Pisces. She is often depicted holding a looking glass. This is supposed to be a sign of her vanity — the classical gods are flawed of course — but usually it simply looks as if she is communing with herself. It’s interesting that in mesoamerican culture, the god shown holding a mirror is an entirely different proposition, very nearly opposite to the goddess of peace in fact. He is the creator god of discord and divination, Tezcatlipoca, the Smoking Mirror. With his mirror, he can see everything. He is also Venus when she is the evening star. Tezcatlipoca’s mirror is like the one in fairy tales, most famously in Snow White. It is a window into another world — like the TV screen in your living room. These days dead TV screens even look like those polished mirrors of black obsidian. One of our most famous astrologers, John Dee, who was at the court of Queen Elizabeth I, acquired a Mexican mirror possibly sent back by Hernán Cortes himself. He used it for conversing with spirits. Its always interesting to see effects of Neptune in water signs, especially so when in Pisces. and in 1900, the first Publicly demonstrated sound film was shown at the “Exposition Universelle” in Paris on that year. It’s a fascinating metaphor, and it’s very interesting to see this generation’s incarnation / version of these aspects from the heavens. Because, while the youngsters (and everyone else :D) are busy gazing at their selfies, Plutonian forces behind the scenes are quietly using the Neptunian / Tezcatlipocan mirror to gather every bit of metadata about them….. Absolutely – and it’s certainly not just one generation. The Dark Net is the Obsidian Mirror. very good point. Another cycle of Neptune in Pisces. In its highest expression it would be all about diving into the SOUL, immersing oneself in intense spiritual searching. We do see that in the new age movement, self- help, yoga, Oprah, Deepak, etc. In its Negative expression it’s divining into the projection, illusion, glamour as Alice Bailey called it. Not to mention the addiction to stars, reality tv, escapism which is what all that narcissism is all about anyway. Never mind the projection onto gurus, soul mates, drugs, etc. Well put. I have some more thoughts on narcissism & astrology for a later post.